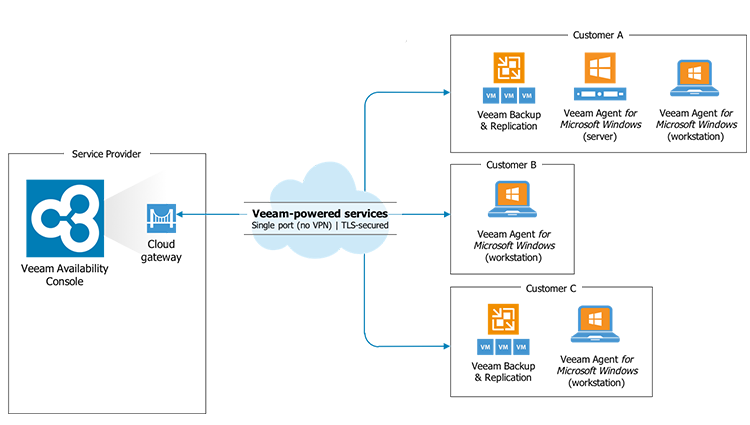 Veeam® Availability Console for Service Providers makes it easier than ever to provide a managed backup service and build (or add) a Backup as a Service (BaaS) or Disaster Recovery as a Service (DRaaS) revenue stream, featuring: Simplified setup — in your own environment or the public cloud — with the ability to easily onboard, differentiate and centrally manage multiple customer environments. Flexible discovery and deployment options to easily identify all the components of your customer’s environment and deploy Veeam-powered virtual, physical and cloud-based Availability solutions. Powerful remote monitoring and management of your customer’s Veeam-powered backups and replicas from a single, powerful web-based UI, without the need for VPN. Streamlined reporting and billing to ensure complete, real-time visibility of your customer’s environments, workloads, usage and billing. Integrate Veeam Availability Console data into your existing portals, applications and workflows via RESTful API, as well as automate common day-to-day tasks. Self-service management and monitoring over a secure multi-tenant portal for authorized administrators and users. Remote monitoring and management of virtual, physical and cloud-based Veeam workloads with Veeam Availability Console. 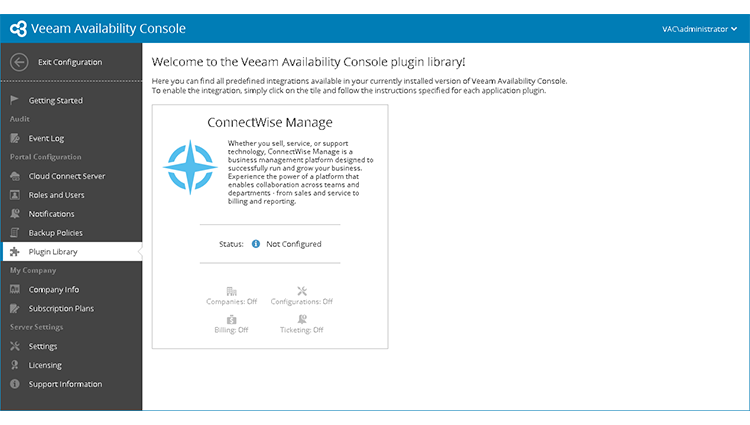 Veeam® Availability Console’s native integration with ConnectWise Manage makes it easy for service providers to deliver more value to customers while reducing administration by consolidating management, monitoring and billing of multiple services into a single pane of glass. 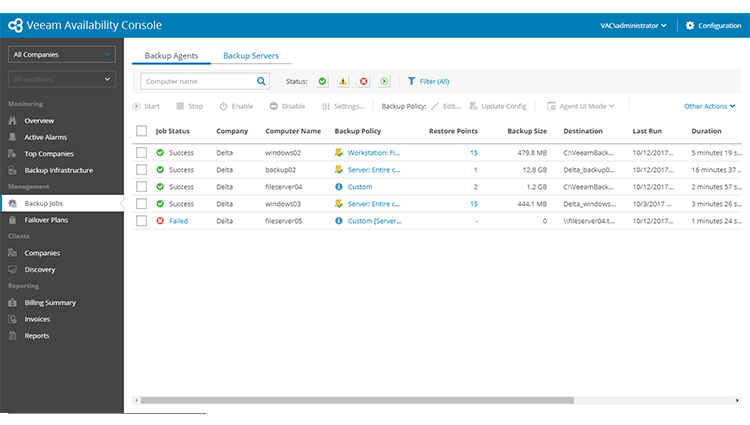 Easily expand your services to include fully-managed backups, Backup as a Service (BaaS) and Disaster Recovery as a Service (DRaaS) options for any existing ConnectWise Manage accounts and customers. Quickly resolve issues before they impact your customer's business through automatic ticket creation within ConnectWise Manage, triggered by alarms from Veeam Availability Console. Reduce billing complexities for you and your customers with a single invoice for all services provided, integrating Veeam Availability Console’s invoices into ConnectWise Manage. Veeam's ConnectWise Manage Integration is certified via the ConnectWise Invent Program. If you need assistance with creating API members or integration setup please send a note to Help@ConnectWise.com and the ConnectWise Manage support team can assist. For any other questions with this integration, please contact the Veeam team directly to resolve any issues.